Destination DC partnered with Food & Wine and Travel + Leisure magazines to present a reception for Bravo's "Top Chef DC" at the Ritz-Carlton, Washington D.C. Hosted by “Top Chef” judges Gail Simmons and Eric Ripert, the event had everything you’d hope a party for a cooking show set in D.C. would: elegant, inventive food (prepared by Ripert’s Westend Bistro restaurant at the Ritz-Carlton); a loose, fun vibe; and the stars themselves — Simmons and Ripert (Gail and Eric, to those of us who have watched “Top Chef” for all seven seasons), who were nothing but gracious to the many wine-emboldened people who asked them to pose for photos. 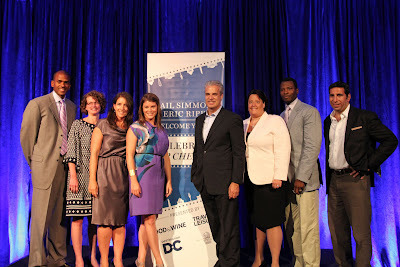 Speaking of which, Simmons and Ripert are at the center of the photo above, flanked by (from the left) Greg O’Dell, president and CEO of the Washington Convention and Sports Authority; Victoria Isley, senior vice president of Destination DC; Christine Grdovic, vice president/publisher of Food & Wine; Elizabeth Mullins, general manager of the Ritz-Carlton, Washington D.C.; Elliott Ferguson, president and CEO of Destination DC; and Jean-Paul Kyrillos, vice president/publisher of Travel + Leisure. During the reception, I had two pretty interesting conversations about cooking for meetings and other events — first with Eric Ripert, then with Sam Kass, assistant chef and food initiative coordinator for the White House, who was a guest judge on an episode of “Top Chef DC” that challenged contestants to take the banner of Michelle Obama’s campaign against child obesity and create healthy, kid-friendly lunches at a D.C. middle school. Ripert said that the key to maintaining quality when you’re preparing food on a large scale is organization — you have to plan everything down to the minute, especially when you’re cooking fish. Kass said it comes down to having a lot of people around — to properly taste, plate, and serve the food. So, they gave more or less the same answer. And meeting professionals should take note of the fact that these world-class chefs point to planning and management as paramount to delivering great food at big events. Because, planning and management — that’s what you do, right?